The leadership of Sekondi-Takoradi Chamber of Commerce and Industry (STCCI) of Ghana has paid a partnership building and experience sharing visit on Abuja Chamber of Commerce and Industry (ACCI) in Nigeria. The 5-man delegation led by the Chairman of the STCCI, Mr. Ato Van Ess said they were in Nigeria to learn from the track records achievements recorded by the ACCI. Receiving the delegation along side key officials of the Chamber, ACCI President, Prince Adetokunbo Kayode explained that, his chamber was making waves now in view of the experience and the need to offer excellent service to members as a mean of adding positive impact to the Nigerian economy. He also explained the internal working arrangement of ACCI as way as the four Centres he has put in place in order to perform specialised functions that would help in growing the Nigerian economy. The four Centres are: Business Entrepreneurship Skills and Technology (BEST), Policy Advocacy Centre (PAC), Dispute Resolution Centre (DRC) and Abuja Trade Centre (ATC). BEST is the training arm of the chamber while PAC specialises in helping the government to fashion and implement policies that would not be injurious to the business community and economy of the nation. DRC is responsible for mediating and ventilating on business disputes in similar manner as ATC promotes, facilitates and gathers trade information data. Prince Kayode also expressed willingness share the template of the Centres TSCCI as well as help with key officials that would help in establishing similar versions in Ghana. The President reiterated the commitment of the ACCI towards doing businesses with Ghana as a step towards ensuring shared prosperity. In his speech the Vice President of ACCI responsible for Information Communication Technology (ICT) who doubles as Provost of BEST Centre, Prof. Adesoji Adesugba explained that progress in the Abuja Chamber was made possible because of the quality of ideas and persons driving the centres pointing out that, carefully selected individuals were head hunted and brought to add value to the chamber. He added that the Honourary Council Membership is one of the strategies that proved successful to the chamber. In their separate remarks, the Vice President of Commerce, Dr. Johnson Anene, that of Women Development, Jummai Oluyede-Mohammed as well as Coordinator of PAC, Mallam Olawale Rasheed, expressed readiness yo help the TSCII to leverage on their networks to improve on what is already on ground. After carefully listening to ACCI, Mr. Van Ess said he was elated at the exemplary developmental strides recorded in the ACCI within a record time. 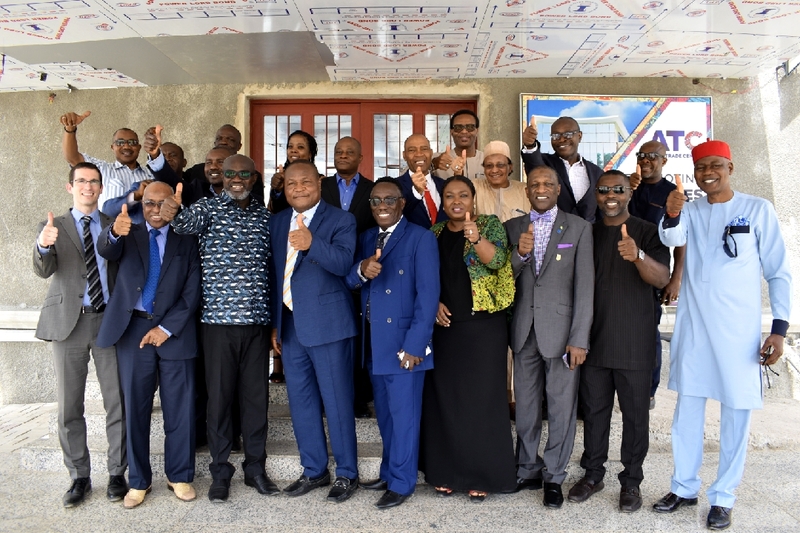 He urged the chamber not to hesitate in opening doors of opportunities for them just as he promised that the understudy mission will enable them to put certain things in order having learnt from the ACCI organogram and template. He hinted that, having experienced a lot of hiccups in the take off of his Chamber, it was critical to learn from a successful chamber like ACCI to get their art right in the on-going constitution amendment to reflect current economic realities in his country. TSCCI President announced that, Honourary Council membership, replica of the Centres, internal transition arrangement and membership drive will form part of the reforms in his Chamber Both chambers also agreed to be of support to each other embark on several joint activities. They are to sign Memorandum of Understanding to formally kick-start the relationship. The STCCI President was accompanied on the visit by: Vincent Annan, Richard Bentil, Matthew Kwabena and Michael Konow.